The remarkable story of Piltdown Man began 43 years ago when Charles Dawson, country solicitor and amateur archaeologist and geologist brought to the Natural History Museum in London and handed to Smith Woodward, Keeper of Geology, a number of specimens. These included fragments of thick human skull bones, chocolate brown in colour, some fossilized hippopotamus and early elephant teeth and some crude flint tools. They had been found, he said, as a result of workmen digging gravel for paths at Barkham Manor, Piltdown, not far from Uckfield in Sussex. The gravel was an ancient river deposit, reputed to be 80 feet above the present river level, where in fact remains dating from near the beginning of the Ice Age were to be expected according to local geological opinion at that time. Woodward agreed to join Dawson in carrying out excavations at the site at the end of May and during June 1912. As a result more specimens were found including a fragment of ape-like jawbone with two teeth, still more bits of skull, several fossil animal teeth and bones, several flint tools-and later on a remarkable bone implement. Scrappy though the remains were they presented a remarkably complete picture of a fossil man, his tools, contemporary animals, in gravel dating possibly from early in the Ice Age or even just before. But there were difficulties. Trouble arose at the first scientific meeting at which Dawson's discovery was described-a meeting of the Geological Society of London in December 1912. The dispute was about Woodward's conclusion that the cranial bones and jaw both belonged to a single individual-whom he called Eoanthropus, The Dawn Man - a strange mixture of man and ape. Woodward gave many good reasons why he thought that the jaw must belong to the brain-case even though, as he pointed out, it was very like an ape's, while the brain-case was certainly very human. Despite this extraordinary combination we must agree about the logic of his conclusion based on the evidence available to him. His belief that a new fossil ancestor of man had indeed been found was bold and courageous and at the time scientifically justifiable. Woodward's argument ran as follows. All the remains in the gravel were found very close together-within a yard or so of each other. The lower jaw and the brain-case were very similar in appearance. They were both of a similar brown color, and also apparently in the same state of fossilisation. The jaw, even though ape-like, did have some important human features, particularly in the teeth. The molar teeth had apparently been worn to a flatness never seen in apes, and only to be expected if the jaw had belonged to a type of human being. The roots  of the teeth (as seen in the X-ray pictures of the time) were also much more like those of human teeth. And finally, the appearances of this ape-like man at the beginning of the Ice Age was just what many authorities had expected to find. In July 1913 a new specimen was found, a canine tooth, ape-like, but worn in a way never found in modern apes. This was strong support for Woodward's interpretation. For all that, controversy continued to rage as to whether it was really correct to link the jaw and the brain-case. Woodward's opponents-first Professor David Waterston of King's College, London, and next Dr. Gerrit Dr. Miller in America and Prof. Boule in France-were not convinced. They could not see how anatomically the jaw could have worked as part of a human skull when it was constructed in so very different a way. But the opposition case was a good deal weaker than Woodward's. They could not explain the extraordinary wear of the teeth. The opponents also had to explain the amazing coincidence of finding, in one place close together, a brain-case without a jaw, and a jaw without a brain-case, all apparently in the same state of preservation. But they decided it was a coincidence, astonishing though it seemed. They maintained that there were two different fossils there, a fossil man, and a fossil ape, both of an extreme antiquity. But this view was dealt a severe blow when the remains of a second Piltdown Man were reported in 1915 as coming from a place about two miles away from the first site. Here again there were pieces of thick brain-case like those found at the original site, and with them a molar tooth, again similar to those in the jaw of the first Piltdown Man. From now on Woodward's ideas held the field and most scientists agreed with. him. In those days the climate of scientific opinion was extremely favour-able to the view that the human ancestor would show such a combination of features of ape and man. It seemed quite feasible, therefore, that a human ancestor should have pronounced chimpanzee characters such as large projecting eye-teeth. Darwin had even sketched such a type hypothetically. And what made it all the more acceptable was that there was nothing to contradict it in the few other human fossils known at the time. 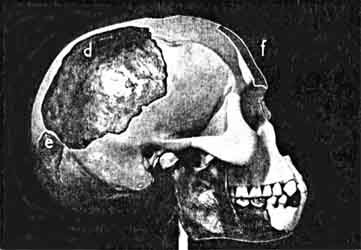 Piltdown Man fitted in rather well as a more primitive being than either Java Man or Heidelberg Man. But he began to fit in less and less well as a lot more human fossils were found in Java and China and South Africa. They all differed from Piltdown Man in their skull characters. Their brain cases were far more ape-like than his, and their jaws decidedly less so. They formed a fairly consistent line of evolution if Piltdown Man was left out. Still, as long as the apparent extreme age of Piltdown Man remained unquestioned, this situation could he accepted. Why should there not be two lines of human evolution, one arising from Piltdown and the other from a different ancestral type. Fig. 1. The Piltdown skull fragments. 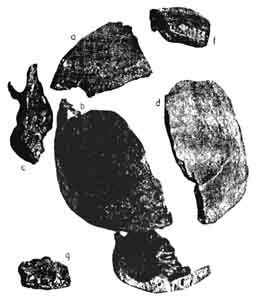 Pieces of a comprised "Piltdown I"; f was apparently kept back to place with g, occipital fragment of another, unexceptional skull: this pair of fragments served in framing "Piltdown II." Approximately half natural size. We can sum up this stage of the prolonged controversy, by saying that if the Piltdown remains were old enough they could be accepted-odd and isolated though Piltdown Man seemed to be. But that situation was not to remain undisturbed for much longer. In 1949 the application of a chemical method of dating fossils threw the whole thing into the melting pot again. By this time we had developed the fluorine dating method. This is based on the fact that buried bones adsorb fluorine from the soil and the amount increases with time. When a number of bones are found at the same site their fluorine content can he used to tell us which is the older. When we applied this test to the Piltdown remains we found to our  great surprise neither the jaw bone nor the brain-case contained more than small traces of fluorine, while the early fossils from the gravel such as the extinct elephant's teeth contained a great deal. This meant that Piltdown Man did not date from before the Ice Age. Both jaw and skull appeared to be comparatively recent as fossils, not older than the latter part of the Ice Age. Fig. 2. Smith Woodward's last reconstruction of the Piltdown skull with addition of the right frontal fragment (f ) originally assigned to "Piltdown II." Scale in inches. Those who believed that the remains were made up of two separate fossils, an ape and a man, did not gain much either from this change of dating. The idea of a fossil ape in England in the second half of the Ice Age seemed highly unlikely considering the entire absence of such remains from the whole of Europe over the last million years; and any case Woodward's arguments for linking jaw and brain-case still held. As things stood till July 1953 it all made nonsense. The idea of a Piltdown Man at the end of the Ice Age was extremely difficult to understand, but the idea of a fossil ape of that age in England was equally impossible to accept. Yet these appeared to be the only possible natural explanations. When we came to reconsider the matter, purely from the anatomical point of view, we were struck by the fact that after all was said and done, the only really strong evidence to link the jaw and brain-case was the peculiar wear of the molars and eye-tooth. If the wear could not be accounted for by any natural explanation, how else? And if the close association of jaw and brain-case could not be accounted for naturally how else could it be? One possibility that could explain nearly all the contradictions was to suppose that a broken bit of modern ape jaw had been deliberately placed with the more ancient brain-case, and that to disguise its modern character and link it with he human brain-case, the bone had been suitably stained, and the teeth deliberately ground down. If this were so we would have a fairly complete explanation of all the circumstances of the find, the suggestion would fit in with the new evidence that it was not of great antiquity, and it would also explain the impossibility of making evolutionary sense out of Piltdown Man. This idea could clearly be tested by looking again at the anatomy of original specimens, and also by improving and extending the chemical methods of dating. This was done. We started from the fact that if the jaw-bone were modern it should have contained less fluorine than the brain-case. The first analysis in 1949 failed to show any significant difference. The amounts we were dealing with were too small to be measured except approximately. But the analysis was accurate enough to prove that neither the brain-case nor the jaw-bone was of the great antiquity previously claimed, though it was not sufficiently accurate to distinguish between a very late fossil and a recent specimen. So, in the autumn of 1953 we drilled into the bones more boldly. And the new and larger samples were analysed in the Government Chemist's Department using a more refined technique. The fluorine in the brain-case turned out to be just high enough to suggest that it was ancient, but the jawbones and teeth were found to contain no more fluorine than modern bones and teeth. That being so, their organic or protein content should have been high. We obtained a direct indication of this in the course of re-drilling the jawbone. There was a distinct smell of burning as the rapidly rotating burr penetrated deeply. Moreover, the ejected drillings consisted of minute shavings, indicating that the mineral matter in the jawbone was held together by an organic matrix. When we drilled the cranial bones in the same way, there was no smell, and the ejected material consisted o£ powder, showing that the organic matrix had largely gone. By chemical analysis we confirmed that the jawbone and teeth contained the same amount of nitrogen and organic carbon as modern specimens. The brain-case on the other hand contained much less. Used as a cross-check to the fluorine test this evidence was conclusive. But  we did not let the matter rest there. We confirmed that the jawbone and teeth are really modern by several other methods. We had to make quite sure that the organic matter was not gelatine or glue with which the specimen had been impregnated as a means of hardening it. Figs. 3 and 4. 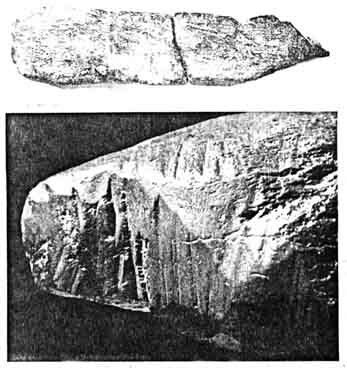 The Piltdown bone implement (1/4), with details of the cuts at the pointed end. The electron-microscope revealed perfectly preserved fibres of organic tissue in a decalcified sample of the jawbone. In contrast to this in the brain-case all trace of such fibres had disappeared. So the jawbone is without doubt modern. And we have also been able to show that it had been coloured artificially with iron to match the brain-case bones. Thus studies of the composition left no doubt that the Piltdown jaw was a bogus fossil, and this conclusion was supported by independent investigation of the anatomical aspects. This side of the work was largely carried out by Professor (now Sir Wilfred) Le Gros Clark. What we call the Piltdown jaw is only a broken fragment. It consists of the greater part of the right side of a jaw, with two of the grinding teeth  in position. The front part is broken off, and also the joint surface by which it hinges with the rest of the skull. Nearly all anatomists have been agreed for some time that there wore really only two features that distinguished it from the jaw of a modern large ape-such as an orang or chimpanzee. These two features are the curious flat wear of the teeth and the apparent shortness of the roots as seen in the X-ray of the jaw taken in 1913. In apes, the roots of the molar teeth are much longer. We have had new and better X-ray pictures taken and they show that the roots are really much longer than was thought. In fact they are just like the roots of modern apes' teeth. The otter feature, the flatness of the wear, was very puzzling, because, while in human jaws the molar teeth commonly wear down to a flat surface quite early, this is never the case with apes' molars at a corresponding stage of wear. That is what suggested that the flatness in the Piltdown molars might have been produced artificially, in order, presumably, to imitate the human type of wear. Fig. 5. Radiograph of the Piltdown canine tooth. The pulp cavity has been exposed on the grinding surface, and the opening plugged with some radio-opaque material. The cavity has been artificially packed from the other end with mineral grains. X 5/3 diam. It immediately led us to carry out experimental filing of modern apes' teeth and to make a most minute study of the Piltdown teeth. A critical and close examination with the microscope at once showed up a number of very curious features that seem to have escaped attention so far. For one thing, the flatness of the biting surface of the molars is astonishingly even all over-as though they had indeed been flattened down by filing or grinding, and the margins of the flat surface are most unusually sharp, instead of being bevelled as you would expect in naturally worn teeth. When, in the course of natural wear, the enamel of a tooth first becomes worn off, the dentine (being less hard) is more rapidly worn away and produces hollows, below the level of the surrounding enamel. But in the Piltdown molars the exposed dentine is actually quite flat and flush with the surrounding enamel. The Piltdown molars show another curious feature. Normally in the lower molar teeth the outer side is worn away quicker than the inner side because it is overlapped by the upper teeth and so gets more worn with chewing. But in the Piltdown molars much more of the enamel has been worn away on the inner side-that is, the wrong way round ! Sir Wilfred Le Gros Clark has said that in the large number of teeth in human and ape jaws, recent and fossil, that he has examined, he has never come across an example in which the inner side of the tooth is so much more worn down than the outer side. But, when an ape's molar is ground down artificially this is just the appearance you do get. A close examination with the microscope shows a series of criss-cross scratches on the biting surface of the teeth-further evidence of the use of an abrasive of some sort. The canine or eye-tooth that was found separately from the jaw is modern too, judged by the very small amount of fluorine, and the large amount of nitrogen, it contains. It has a dark coating which has been examined by authorities at the National Gallery. They reported that it is an oil paint-probably Vandyke brown. There has always been rather a mystery about this eye-tooth. An X-ray picture shows that it is a young tooth-probably one that has only just come through at the time of its owner's death. But it is so severely worn that the whole of the enamel on the inner side of the tooth has been entirely worn away. And, more than that, it has been worn away in a peculiar manner never seen in either man or ape. This contradiction is explained at once if the crown of the tooth has been ground down deliberately. A new X-ray has shown that so much the top of the tooth has been ground away that at one point there is small hole into the pulp cavity and this hole has been plugged with some kind of plastic material. This entirely unnatural state of affairs was not shown up in the early X-rays-because unfortunately they were not taken at just the right angle. This independent anatomical evidence makes it quite certain that teeth are modern ape's teeth that have been skilfully and deliberate disguised. With Sir Wilfrid Le Gros Clark's assistance we have tried to decide whether the jaw and the teeth are those of a chimpanzee or orang-utan. Some anatomists have wondered whether it really is possible to produce all the appearances of the Piltdown molars by filing down the teeth of any modern ape. But we found that you can do it quite easily provided you use the teeth of an orang-utan. The resemblance between our experiments and the Piltdown teeth is really rather startling, because it is possible to produce just the same shape of tooth, and the same appearance of the exposed patches of dentine on the biting surface. And in X-ray photographs also they look almost identical. We have in fact reproduced the whole jaw, and the eye-tooth, and we are reasonably sure that the Piltdown specimen is actually that of an orang-utan-possibly a female not yet fully grown. It seems clear then that the Dawn Man of Piltdown has been effectively disposed of, and that for forty years a female ape's jaw has masqueraded as one of our ancestors. The remains were originally supposed to date from just before the Ice Age and the skull was accompanied by tools and fossil animals which supported this idea. We have considered the question of their authenticity very thoroughly. The flint implements are rough flakes that might be of any age. They are of a reddish colour, matching that of the gravel, but they have been artificially stained, in one case with chromium as well as iron. We know this from Dr. E. T. Hall's spectrographic analysis in the Clarendon Laboratory, Oxford, as well as through chemical tests carried out in the Mineral Laboratory of the Natural History Museum. When we chipped the implement to get a sample for chemical analysis we found that below the stain there was a white crust just like the flints you get on the chalk downs-whereas the local gravel flints are brown through-out. Fig. 6. The "grinding" surface of the second molar tooth in the Piltdown jaw. The outer edge is uppermost in this photograph. X 4 diam. Even more striking as a forgery is the famous bone implement. It is a large slab of fossil elephant thighbone supposed to have been pointed at one end by its prehistoric owner. But if you try to whittle down a piece of bone when it is fresh, even with a good steel knife, you find it very difficult-with a flint tool it would be impossible. Even in 1914 some were doubtful about this specimen; and the French archaeologist Abbé Breuil, realizing the impossibility of its having been shaped with a flint knife, later suggested that the bone has been gnawed by a giant beaver. A more detailed examination of the cuts has made it obvious that they were produced by a modern steel knife. The fluorine test has established that the bone is a fossilized bone, and we have shown that you can sharpen a fossilised bone of this kind with a knife, just as you can shape a lump of chalk. Clearly the Piltdown bone implement must have been made in this way. So much for the tools. The animal remains from Piltdown have been  famous because they include the remains of a rare type of elephant, of mastodon and of a rare type of rhinoceros, known to have become extinct in Britain early in the Ice Age. The great interest in them lay in the fact that such fossils have never been found anywhere else in Southern England. And little wonder, because we now believe that all these animal fossils were planted in the Piltdown gravel, in order to suggest that the skull was that of a man living before the Ice Age. Proof that the elephant teeth are of foreign origin is supplied by a new method of relative dating. Dr. C. F. Davidson and Mr. S. H. U. Bowie of the Geological Survey of Great Britain have been studying uranium in fossils. Uranium, like fluorine, accumulates in buried bones and teeth but at rates varying from place to place. The uranium content of a fossil can be estimated by measuring its radioactivity. Some of the Piltdown fossils have the same radioactivity as those genuinely found in deposits dating from before the Ice Age in East Anglia, but the three bits of Piltdown elephant teeth are more than ten times as radioactive. Indeed, they are more radioactive than fossils from anywhere of the same period that have been tested, with the only exception of some from Tunisia. So we must infer that these pieces actually came from a collection of foreign fossils. Their red-brown colour suggested to us that they had been artificially stained, and indeed we found traces of chromium on them as well as iron. Fig. 7. Autoradiograph produced by placing one of the "Piltdown" elephant molar fragments in contract with very sensitive photographic film for 6 weeks. The print is due to the exceptional uranium content of the specimen, higher than that of any comparable specimens that have been tested with the exception of early elephant molars from Tunisia. Slightly reduced. The dark brown hippopotamus molar tooth from Piltdown was formerly supposed to be of the same age as the elephant teeth, but unlike them it contains very little fluorine. On the other hand it has lost almost all trace of organic matter which indicates that it is certainly ancient. Cream-white hippopotamus teeth from caves in Mediterranean islands have just this composition. The Piltdown specimen only differs from them in its dark colour. On testing it we found that it too contains the tell-tale chromium. For a long time we believed that the human skull bones had been genuinely found in the Piltdown gravel, but eventually we found evidence that they too were fraudulently introduced into the Piltdown gravel. Their fluorine content is just enough to show that they are ancient  specimens, perhaps even prehistoric-but we now have proof that their dark brown colour is entirely artificial. Dr. G. F. Claringbull, Keeper of Minerals in the Natural History Museum, made au X-ray analysis of the mineral structure of the Piltdown bones for us. This revealed that the phosphate mineral in the human brain-case has been partly changed to gypsum (calcium sulphate). But gypsum is not found in the Piltdown I gravel. Moreover, experiments by Dr. M. H. Hey in The Mineral Laboratory of the Museum have shown that if you stain a partially fossilised bone with an acid iron sulphate solution the bone is partly changed to gypsum. We have no doubt that the Piltdown skull was stained in this way to match the gravel in which it was to be planted. The unusual thickness of the bones suggests that the skull used as a basis of this hoax was a pathological specimen obtained presumably from an ancient grave (but where, who knows?). The "second Piltdown skull" was apparently made up by placing an artificially abraded molar tooth of an orang-utan with a piece of exceptionally thick forehead (frontal) bone) evidently part of the first skull that had been held in reserve, and a scrap of the back of another skull stained in the same way. This last occipital fragment was not unusually thick, but then it was chosen to duplicate the thinnest part of the first skull. We think that the chromium detected in the jaw-bone, in some of the skullbones, in many of the fossil animal bones and teeth, and on one of the flints, indicates that a dichromate solution was at first used by the forger in an attempt to assist the oxidation of the iron salts used to stain these specimens. "We have laid the ghost of Piltdown Man, who, as it happens, never fitted very happily into any scheme of man's evolution. Indeed we have gained, because half a dozen new experimental methods of studying fossils have now been developed which will not only make any repetition of such a hoax impossible in future, but will materially assist the scientific study of fossils"
Figures 1 through 6 are reproduced here by courtesy of the Trustees of the British Museum (Natural History); Figure 7 by courtesy of the Director, Geological Survey of Great Britain.